Smart hosting connects your existing email service to LuxSci's outbound email servers. All outbound email sent by your users passes though LuxSci for processing before reaching your recipients. There are many reasons why you would want Smart Hosting. For example, if you have an in-house Exchange server, Office365, or GSuite, you can use smart hosting to add encryption to you outbound email, mask your IP address, improve your email deliverability, add outbound email archival, etc. Your ISP will not allow your mail server to send outbound email, or limits the quantity of email that can be sent. Your Exchange Server cannot send email directly for your organization. Your outbound email systems do not support SMTP Authentication. You need to hide the IP address of your mail server using IP address masking. 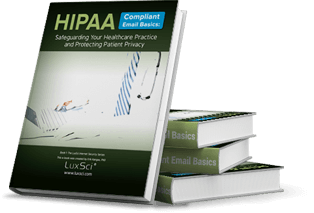 You must ensure all outbound email is Archived, or secured for HIPAA compliance. ...the reasons go on and on. It is a snap to configure your Google Suite or Office365 account to send all outbound email through LuxSci for processing and delivery. All you need is a LuxSci email account that has users corresponding to all of your Google or Office users. E.g., if you have 100 users in the domain "mydomain.com" in GSuite, then you would get a LuxSci account for "mydomain.com" and setup the same 100 users. Once smart hosting is enabled in Office365 or Google, and smart host relaying is enabled in LuxSci for your users, all of your outbound email will seamlessly flow through LuxSci—no per-user configuration or changes are needed. With GSuite and Office365 smart hosting, LuxSci users are authenticated by the Google or Microsoft IP addresses from which the messages are sent and are identified by the "From" address in the email messages. Configure exchange, postfix, sendmail, or whatever email system you use to smart host email by authenticating to LuxSci as this user (i.e. using its username and password). LuxSci then identifies the actual sending user by the "From" address of the message sent. Connections from these IPs are allowed and treated as if the specified users had actually authenticated. Smart hosting users have the same sending limits as other LuxSci business email users — 300 messages/day/user. If a user hits the 300 mark, his sending is suspended until the next day. Some customers require higher sending limits. This is available for any smart hosting customer using our High Volume Secure Sending add-on. High Volume allows you to pick and pay for the sending volume appropriate for your account as a whole (in terms of a maximum number of message recipients each month). Customers requiring more than 100,000 recipients/month are required to get a dedicated outbound email server and IP address. Contact LuxSci for more information. Searchable, sortable, and downloadable reports of messages sent. The recipient server's delivery response. Aggregate reports give you overall delivery statistics on a daily and monthly basis. Tailor and receive automated email alerts (for delivery failures) when and how you choose. These email alerts are HTML for easy reading. They also include a CSV (Excel) file with all of the data for easy analysis. These reports make it easy for you to manage your mailing lists, discover addresses that are spelled wrong, and to remove old and non-working addresses. SMTP Services authenticated with a username and password are supported and recommended. SMTP Services authenticated by the connecting IP address and/or the From address in the message are supported for compatibility with systems that do not support username/password authentication (e.g. G Suite and Office365). Use of your choice of insecure SMTP, SMTP over TLS, and SMTP over SSL. You may optionally choose to lock down your account to enforce the use of SSL or TLS. Alternate ports for SMTP access, including use of port 80. This helps ensure the sending process even if firewalls or ISP blocking policies exist. Hide the IP address of all computers or servers you use to send messages. Blocking your own address helps prevent messages from being blocked by the recipient. Messages can be up to 200 MB in encoded size. This includes all attachments. Sent to just one IP address or as many as 1000 recipients per message. Individual users are restricted to 300 messages per day unless you sign up for a "High Volume" account, which allows you to send as many messages as you purchase. We collect spam reports via agreements with major ISPs. This helps us detect spamming and other issues quickly which helps keep our servers off of black lists. Users and administrators can peruse SPAM complains reports in our web interface. Users and administrators can also have digests of their received SPAM complaints emailed to them automatically. These contain detailed information in attached CSV files so users know about any issues as soon as possible, making opting complaining recipients out of mailing lists quick and easy. [Optional] Configure DKIM for the domains from which you send and receive information. This allows the recipient address to add you to their DNS. This helps them verify your messages and improves deliverability. [Optional] Automatic Return Path customization so bounced messages directly indicate failed addresses. Available for extremely high volume delivery to isolate your sending. Direct copies of all sent messages sent to another email address of your choice. Send encrypted email to anyone with an email address using SecureLineTM. Use allow and deny lists to control to whom or to what domains messages can be sent. Send copies of all outbound email messages to an email address of your choice. Scan all outbound email for specific content (keywords, phrases or regular expressions). Matched messages can be denied, sent to an auditor, or auto-encrypted using SecureLineTM. WebMail access for sending email messages; includes an integrated calendar and address book. Disk space, private labeling, web hosting, WebAidesTM collaboration tools and more.